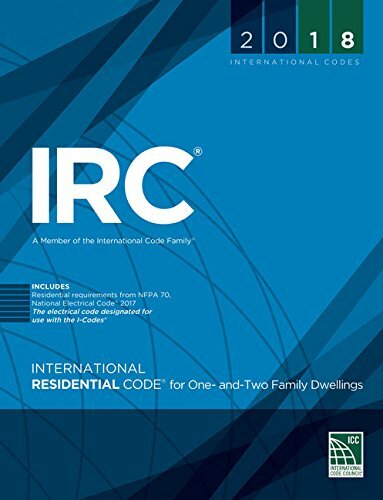 This comprehensive code comprises all building, plumbing, mechanical, fuel gas and electrical requirements for one- and two-family dwellings and townhouses up to three stories. The IRC contains many important changes such as: An updated seismic map reflects the most conservative Seismic Design Category (SDC) based on any soil type and a new map reflects less conservative SDCs when Site Class A, B or D is applicable. The townhouse separation provisions now include options for using two separate fire-resistant-rated walls or a common wall. An emergency escape and rescue opening is no longer required in basement sleeping rooms where the dwelling has an automatic fire sprinkler system and the basement has a second means of egress or an emergency escape opening. The exemption for interconnection of smoke alarms in existing areas has been deleted. New girder/header tables have been revised to incorporate the use of #2 Southern Pine in lieu of #1 Southern Pine. New tables address alternative wood stud heights and the required number of full height studs in high wind areas. If you have any questions about this product by ICC (distributed by Cengage Learning), contact us by completing and submitting the form below. If you are looking for a specif part number, please include it with your message.